This article describes instructions and configuration examples for setting up two DNS servers and an administrative web interface with NicTool. Setting up a very basic DNS infrastructure for oneself isn’t really that hard. There are a lot of complete guides on the net for setting up a few BIND servers and making the first server notify and update the others. Also, the overall documentation on DNS server software is pretty good. One thing outside of the basic setting, however, is the consolidated administration of every name server from a single place. Because a DNS zone (e.g. a domain name) needs two or more separate name servers, upon adding or removing a zone from the name server system there are configuration parameters that need to be updated on each of the domain’s name servers. In a very basic setup, setting an administrator can make the changes to each of their servers’ configs by hand. Nowadays modern name servers can do zone transfers and update their zone information automatically from the master server in which case changes to config files by hand are not necessary unless adding or removing a zone. This method is the most straightforward to set up, has the smallest overhead, and works well for small and quite static setups. On the other hand, if there are several administrators, many servers, or numerous zones which are added, modified, or removed often, the burden of making changes by hand becomes very pronounced. It’s also easy to make mistakes when editing configs by hand. To ease this administration routine, there exists a tool called NicTool which presents itself as a web interface to manage the data on a predefined set of name servers. The tool’s backend syncs all config and changes to the name servers and there is no need to touch anything other than the web UI. This document describes setting up two DNS name servers onto two separate hosts and the installation of DNS server administration tool NicTool. The article’s example was curated on CentOS 7 servers but you can, of course, use any Unix-like system of your liking. ns2 (10.234.55.66) as a slave NS with NSD. the server generates specific config files according to the current database and takes care of exporting them to each name server. The article assumes the reader has the basic skills of administering their server machines. A significant configuration directive is include with which we will feed the NicTool-generated configuration to BIND. Because we are running an authoritative name server it’s important to ensure we are as widely reachable as possible (listen-on and allow-query). Equally important is not to allow recursion for unknown clients because of the amplification attack risk (US-CERT, ISC). Enabling allow-transfer only to trusted hosts limits potentially needlessly big transfers of data. It’s recommended in many sources as a best practice to hide name server version information to hinder easy harvesting of exploitable systems in case vulnerabilities are found from the name server software. However, as of writing this article, at least querying several root servers for such information (CHAOS bind.version) gives mixed results; some servers seem to reveal their version and some others don’t. So far I haven’t encountered any proper research which would state if obscurity is actually beneficial from the viewpoint of server administration. That said, was the version info hidden or not, the most critical part is obviously to commit to continuous administration of the server and keeping it up to date. Authoritative name server, as its name says, has authority over a zone (e.g. a domain and all of its possible subdomains). It means the authoritative name server is the master source of the information regarding the zone and it can also delegate some authority onwards to another server. For example, the authoritative name servers for google.com are ns[1-4].google.com when writing this. These servers know every hostname and subdomain under the google.com zone and if they don’t, they know another server which knows. ns[1-4].google.com get their authority from .com top level domain name servers (which are [a-m].gtld-servers.net) which know every authoritative name server of every domain of com zone. In other words, they delegate the authority to other name servers and return the information about the delegated name servers to be queried next by the client. Recursive name server, or resolver, then, is a server which answers to all kinds of queries by clients and does the resolving work for them. Recursive name servers are no source of original information as they get every piece of information they know from authoritative name servers. Resolvers work in between the authoritative name servers and clients and by caching the results obtained in previous queries, they can reduce the traffic leaving a network and the load on authoritative name servers. So a recursive name server is fine if it’s not openly queriable by everyone, but only a specified range of clients. Recursive and authoritative server functions may reside in the same server instance but I would discourage it on the principle that authoritative name servers shouldn’t do recursion at all. That is on the grounds of performance issues and possible easy misconfiguration. In this example, the recursive function is altogether disabled in BIND configuration, and NSD isn’t even capable of doing recursion. Now it’s time to install NicTool. First NicTool prerequisites are satisfied, then NicTool files are installed and the system configuration is done. On many systems, there already exists a bind user account but as a little extra security measure, I decided to go for a totally separate account. That’s because I want to allow NicTool to alter only specific config files – not everything that bind user has write access to. Some dependencies might fail installation and it’s not a big deal. Just install them directly from CPAN. Now everything should be ready for setting up the NicTool itself. Here the NicTool database and NicTool’s own base configuration are set up. Enter the database hostname and root password (that’s empty for default installs). Database name and user nictool are fine. Database password should be different from any other password as it’s used only with the database connection. Give the script an email and a password for logging in at the NicTool GUI. The password should be totally solid, the infrastructure’s integrity depends on it. You should probably record the information the script gives you. Now to do NicTool server’s system configuration. Edit nictoolserver.conf, define the previously set database password in the nictoolserver.conf config file, and check the other config parameters are correct. Then configuring the NicTool client. here are the parameters to be used for default DNS values. NicTool system configuration should be fine now but NicTool is yet waiting for the web server setup before it can be accessed. NicTool client (frontend) is served with Apache web server, at this step it is going to be installed with encryption. The CentOS template on UpCloud includes firewalld which blocks DNS, HTTP and HTTPS connections by default. Enable these with the following commands. Follow the instructions to complete the certificate acquisition. In the last question about whether to redirect HTTP traffic to the encrypted channel, choose yes. "Please choose whether or not to redirect HTTP traffic to HTTPS, removing HTTP access." Let’s Encrypt should request and install a new certificate, and modify the default vhost to make it redirect to HTTPS. This tells cron to run the command as the ‘root’ user every Sunday (‘7’) at 2:16 o’clock. Then to hone the Apache config. At a CentOS setup, begin by blanking the default ssl.conf. I backed it up to /root. Blanking the file prevents system updates from replacing it. On other distributions or OS’es, your procedure may vary, but the desired config is presented later. RedirectMatch directive is there to redirect the NicTool host’s HTTP root to a real (e.g. company) website. One should switch comments at the beginning of the lines on DocumentRoot configuration block to host NicTool in the HTTP root of the server. In DirectoryIndex there has been added index.html as a fallback option so that some directories can have an HTML index page; try removing index.html if you encounter problems. Now the NicTool client/frontend should be working. Next NicTool needs to be populated with the name server info and the server/backend which executes the exports needs to be configured. Here NicTool is set up with the minimum required amount of information to ultimately complete the setup. The payload (other zones and resource records) can be added whenever it suits the user. Firstly, one should add a user for themselves from the NicTool web user interface (UI) and log in with it. When logged in at the web UI, at the Nameservers tab edit the name servers. 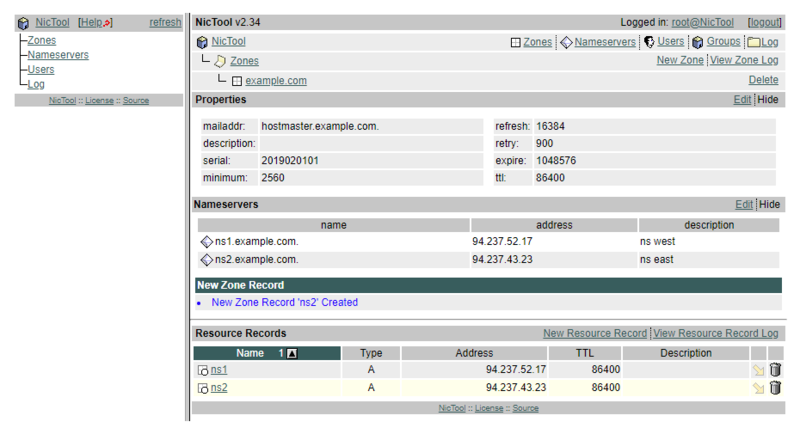 In the web UI’s Zones tab, there should exist at least one zone with the freshly edited name servers selected as the zone’s name servers (so that there is something for NicTool to export). Then add at least A records for the name servers in the new zone. su -m nssync -c "mkdir ns1 ns2"
-> Running nt_export.pl should show name servers that NicTool knows of. Note: For me, there was something odd at this step and I didn’t get the listing as described in the documentation and elsewhere. Anyway, it seems one can get the nsid information from the NicTool GUI too: just look at the ID number in the link URLs when configuring each name server. -> This generates the run file which is basically a nice wrapper script for executing the export. Then open the run file in an editor and change the user name to nssync as below. To give an unprivileged user the authority to reload the BIND config, sudo is used. The privilege must be granted in the /etc/sudoers file, open it using visudo. -> The line gives nssync user the permission to run the BIND named reload command rndc reload via sudo and no password. Actually, notify and transfer shouldn’t be needed since we push all the configs to slave servers. They’re here as an example, one should remove them at their discretion. Now the first name server should be working, then to install the second. Up to this point all commands have been given to ns1. From now on the server is indicated before the command. # Include optional local configs. # Enable remote control with nsd-control(8) here. # set up the keys and certificates with nsd-control-setup. The last include: feeds our NicTool generated configuration to NSD. Although on CentOS 7 most of the defaults are fine, some things are explicitly defined in the configuration. You should follow the comments in the config file and read nsd.conf(5) manual when configuring your own server. nsd-control-setup should create the keys and certificates into the default place so separate configuration in nsd.conf shouldn’t be needed. You can of course explicitly define the files if you want. Run the export – it will fail because login hasn’t been setup yet but it will generate the Makefile. ssh [email protected]10.234.55.66 "sudo nsd-control reconfig && sudo nsd-control reload"
The IP address in the above config example refers to ns2. The above line grants nssync user the ability to use nsd-control without password. In which the from= is the private IP of the master nameserver from where the key is accepted only. SSH fails to check the remote host key. SSH may also be forced not to do the strict key checking by adopting this option in the rsync command: -e 'ssh -o StrictHostKeyChecking=no'. However, I wouldn’t recommend using it in a real-world environment. One of the last steps is to make the exports run automatically. As the export to a specific server is done by executing the corresponding run script, we can run each export periodically from cron. The following lines run the run scripts at the interval of 15 minutes. One line should exist for each synced nameserver. In other words, the changes made using the NicTool GUI are exported to nameservers every run. One should adjust the interval to their needs. At this point each run file in /opt/nictool/ns?/ has to be checked that the command suited for periodical execution is uncommented and the command for interactive use is commented out. # For interactive human use. # regardless of DB changes since the last successful export. #exec su -m $EXPORT_USER -c " ./nt_export.pl -nsid 1 -force -pfextra "
With the new name servers up and working, you migth want to delegate authority to them. The ns1 has already been configured as authoritative but your domain still needs to know where to find the server name records. This process will depend on your domain name registrar but should be quite simple. Go to your domain name registrar and log in to their control panel or dashboard. In your domain’s management, find the option that allows you to specify custom name servers. Enter the public IP addresses of the ns1 and ns2 in the available fields and save. Telling your domain name registrar to delegate authority over your domain to your new NS allows the setup to take control of the domain. Instead of the regular A records, the registrar will create a glue record to the specific IP addresses which tells other name servers on the internet who to ask about your records under domain. Once done, the domain name registrar will begin to advertise the new name servers as authoritative over your domain. The changes might take some time to propagate, usually between 24-48 hour. NicTool should be now able to export the respective configs to ns1 and ns2 automatically and reload the servers. Making changes to DNS records from the GUI and running corresponding run scripts on ns1 should now be fully functioning and export each configuration without any further user intervention. By adapting these instructions more name servers can be added to the system. and it takes me tangled. Hi Alex, thanks for the feedback. The IP addresses used in the tutorial are private IPs, 10.234.44.55 for ns1 and 10.234.55.66 for ns2. All domain names using example.com need to be replaced with your own domain for the name servers to work. We’ve added mentions and highlights to remind readers to replace the values where needed.